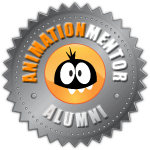 Some of you were aware that I’ve been a student at Animation Mentor, the online animation school. I recently completed the program there and am officially an alumni. Of course the reason I went through this program to begin with was for Lumaglyph, so it’s probably easy to imagine that there is animation in our future. I’ll keep most of the details under wraps for the time being, but the significant part for today is that much of my spare time is freed up. That program is a lot of work, and I’ll admit, it consumed my spare time over the last few weeks and left Glen on his own for Hackberry Hollow. Now, with our new production schedule for Hackberry Hollow that Glen made, completing the scripts by the end of the year is feasible. Let’s get cracking!